When someone mentions the Declaration of Independence, we generally think of the hand signed vellum document on permanent display in the National Archives. What most Americans don’t realize is that 200 engraved facsimile copies of the Declaration of Independence were also authorized by Congress less than 50 years after the original manuscript was signed in 1776. (Actually, the first official copies of the Declaration of Independence were produced in newsprint by Baltimore printer Mary Katherine Goddard in 1777. For a timely discussion of Goddard’s contribution to the history and legacy of the Declaration, see Petula Dvorak’s column in today’s Washington Post.) 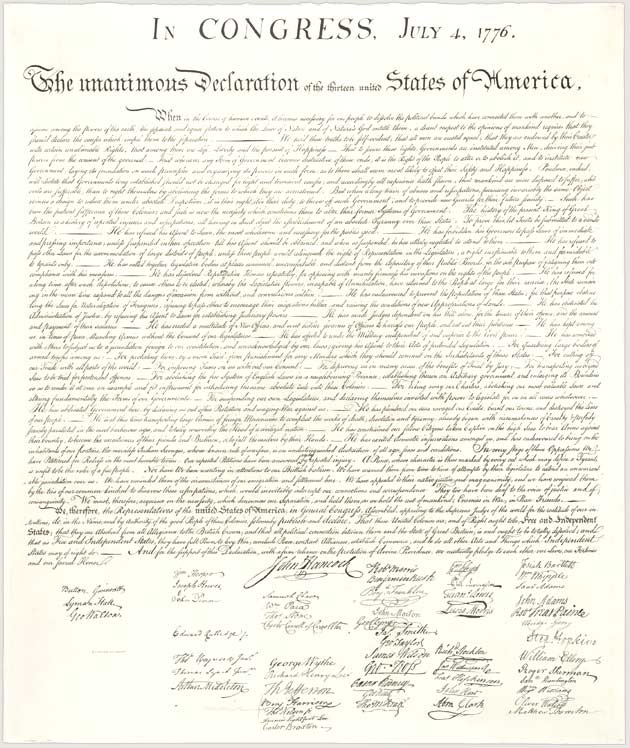 Printed on vellum and distributed to a select group of former signers, former presidents and statesmen, authorized limited edition engraved replicas of the Declaration of Independence rarely appear at auction. But later paper copies made from the authorized facsimile do come up for sale occasionally, and those “antique copies” can realize tens of thousands of dollars when offered at auction. Congress first became aware of the Declaration’s condition in 1820. Improper handling, constant exposure to light and extreme temperature changes had taken a toll on the fragile manuscript over the years. By the time Secretary of State John Quincy Adams, son of signer and former President John Adams, was approached by Congress to assist in preserving the Declaration, much of the original text and many of the signatures had faded significantly. Enter engraver William J. Stone of Washington, D.C. In 1820, Secretary Adams placed a Congressional commission with Stone to produce an exact copy of the Declaration of Independence. Specifications were precise. Copies were to be engraved on copper plates and include both text and signatures. The final draft would be printed on vellum, like the original, and approximate the dimensions of the actual document, which measured 24 ½ inches high by 29 ¾ inches wide. Finally, in order to facilitate his work, Stone was permitted to remove the actual Declaration of Independence to his Washington shop where he could work directly from the document for as long as it took to fulfill the order. It took three years. When Stone presented his completed engraving to Secretary Adams on May 23, 1823, the Department of State authorized 200 copies printed on parchment. (Stone printed 201 copies and retained one for his family.) The printed copies were distributed to a select group of dignitaries and statesmen including the three surviving signers –John Adams, Thomas Jefferson and Charles Carroll of Carrollton—the Marquis de Lafayette, President James Monroe, former president James Madison, members of the House of Representatives, governors of states and various universities. Not surprisingly, authentic William J. Stone engravings of the Declaration of Independence are rare. All are printed on parchment and include the engraver’s imprint (with an “I” instead of a “J” as his middle initial) at top left and top right of the document. Stone engravings also include the Department of State’s inscription complete with J.Q. Adams' name and date "July 4, 1824." When they do come up for auction, they usually sell. The last known sale of an authorized copy of the Declaration of Independence, engraved and printed by Stone, measuring 25 ½ inches high by 30 ½ inches wide, sold at Heritage Auctions in Dallas for $597,500 in April 2012. But there’s more to this story. In 1833, historian and printer Peter Force (1790-1868) was authorized by Congress to compile a multi-volume American history titled “American Archives.” Force’s nine volume history, which was written between 1837 and 1853, focused on the period 1774 to 1776. In order to boost sales, Congress authorized Force to make a limited number of copies of the Declaration of Independence from William J. Stone’s original copperplate that was removed from storage at the Department of State solely for this purpose. Force was authorized to produce 1,500 rice paper copies of the Declaration from Stone’s original plate. The completed copies, which were folded and tipped into Volume 1 of the “American Archives”, did not carry William Stone’s original imprint or the Department of State’s inscription; instead, Peter Force’s paper copies of the Declaration were printed “W.J. STONE SC. WASHN.” at bottom left. Peter Force rice paper copies of the Declaration of Independence appear at auction with greater frequency than original William J. Stone engravings. A Force copy sold at Heritage Auctions for $20,000 in April 2013 while a comparable copy sold at Sotheby’s in 2013 for $17,500.